When Experts want to create useful, eye-catching brochures - this is what they do. And you should too. Your doctor's office has them, your favorite restaurant gives you one when you sit down, you picked one up at a golf store to research that new driver you heard about, that new DVD player you just bought-yes, that has one too. What's the connection? In a word, brochures. Each are examples of how printed brochures convey important information that will help you take action - what to buy, where to go, what to do or what not to do! Why are brochures so important to your marketing plan? Brochures, when designed well and eye-catching, make people want to read them. Very few marketing or advertising pieces allow as much flexibility as full-color brochures do. As product sheets, flyers, tri-folds or newsletters - however you call them and fold them, they are truly multi-purpose. Printing brochures can project your brand and provide a large amount of information in an easy-to-read, handy piece. Brochures are a cost-effective direct mail marketing solution. 1. When sitting down to start your brochure design, first take into account the purpose of your piece. Determine what information and image you want to convey. If it's a gardening store or nursery doing a monthly newsletter, the content of your piece should be timely, fit with the season, and provide helpful planting or growing tips. If you're promoting a five-star restaurant, the picture painted by the brochure should be one of quality, luxury and a memorable experience. Think about what you want to highlight and make sure these points come across in the brochure. What does your audience need? Whoever reads your brochure needs to know the name of your business. If the reader remembers the nice photo of the resort on the beach, but not how to make contact, you've failed. Feature the business name prominently in the design, or know why you don't need to and make a conscious decision to downplay it. Where are your customers? If you expect them to do something with the information in the brochure, make it easy for them. Provide a way to contact you or get more info. Include a phone number, address, email and/or url. Who are they? Not every brochure design will work for every kind of customer, or for promoting every kind of business. A straight-forward, informative brochure layout with minimal photos may be perfect for a how-to on applying, lawn fertilizer, but it would lack the pizzazz and excitement needed to promote a hot new vacation property or special event. Always think about your targeted customers' needs, interests and tastes. 3. Think about your big picture. You're going to design a brochure that will become part of your whole marketing look, feel and brand. Whether it is your first or your 100th brochure design, take into account that you will want it to be cohesive with the rest of your collateral. A great example is Apple. Whether it's an iPod, iPhone, iBook--everything the company does conveys a recognizable look and feel, which has grown to become as important to its identity as the familiar Apple logo. Apple's TV commercials look like its Web site, which looks like its marketing brochures, which share elements with its product packaging and manuals. When it comes time to design the details of your printed brochure, think about ways to maintain consistency: ink choices (CMYK vs. Pantone, metallics), font choices, large amounts of text vs. open white space, image style (photography, vector art, illustrations), size of the piece, paper type and feel, and more. You stand a better chance of creating positive brand recognition with multiple marketing pieces when they're part of a whole, not just something here or there. When you consider the whole package, you're leveraging the brochure you're designing today with the ad you'll place next week and the postcard mailer you'll produce next month. 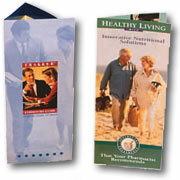 Creating brochures with branding in mind shows that you're thinking about your long-term results. It also boosts customer confidence that you know who you are in your marketplace. This increases your opportunities for future business, from multiple avenues. So, What Do I Really Need? The number of possible brochure subjects is endless. But despite the need to customize and craft each brochure, the basic building blocks remain the same. Whether your customers are looking for take-out pizza or fine wine, dental care or a new career, their wishes, needs and an understanding of the big picture is your foundation for everything else. The marketing brochure is an ideal vehicle for transporting valuable information in an efficient and conveniently sized package. A brochure is more than an advertisement; it conveys depth, context, and character. It should be user-friendly, inviting to readers, and designed in a manner that reflects your business and is consistent with your other marketing material. Get started with these key steps to creating brochures. Your understanding of the design process will grow, and with it knowledge of your customers' needs and how to reach them with effective brochures to help grow your business. Once your brochure design is ready, you can order high quality brochure printing on the 8.5x11, 8.5x14, 11x17 or 11x25.5 brochures ordering pages. You can also learn about some of the technical issues to keep in mind when creating your brochure such as resolution, bleeds and layout in our Printing Knowledge Center.